Very exciting news – the Fan Bay Deep Shelter blog confirms that the Fan bay sound mirrors have been found! Even better, “It looks likely that only fairly limited restoration work would be required to stabilise these structures and leave them open for permanent display”. For now, excavation has stopped until a topographical survey and planning application have been completed. Visit Fan Hole sound mirrors: An archaeological dig for full details and photos. 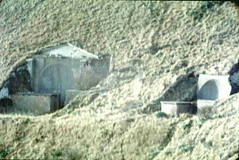 Photo of the Fan Bay sound mirrors, which unfortunately are now buried. I went for a look round the area once, but failed to find evidence of them.